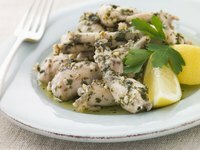 A French delicacy, frog legs are also prized all along the Gulf Coast of the United States, where the French influenced many cooking methods and an abundance of marshy land yielded a steady supply of frogs. The mild-flavored white meat has a flavor often described as being “like chicken.” Although the meat is frequently deep-fried, the batter often overpowers its delicate flavor. A simpler preparation such as baking allows the flavor of the frog legs to take center stage. Grease a baking dish with butter, oil or cooking spray. Rinse the frog legs under cold water and pat them dry with paper towels. Place the frog legs in the baking dish, arranging them in a single layer. Season the frog legs with just salt and pepper to allow the natural flavor of the meat to shine. For added heat or flavor, include garlic, onion and cayenne pepper to taste. Sprinkle bread crumbs on top if you like a light crunch. Alternatively, top the legs with a sauce, such as melted butter with lemon juice, butter and parsley. Bake the frog legs uncovered for about 30 to 35 minutes. Check the meat for doneness by inserting an instant-read thermometer into the meatiest part of one leg. Like other types of game, frog legs should be cooked until the internal temperature reaches 165 degrees F.
Marinate the frog legs for about three hours before baking them to infuse the meat with extra flavor. Use your favorite meat marinade, or combine a neutral oil, such as vegetable oil, with the aromatic seasonings of your choice. Examples include minced onion, chopped fresh herbs, garlic, lemon juice, salt and black pepper. Place the mixture in a resealable plastic bag or a baking dish and add the frog legs, tossing them to coat. Avoid overcooking the meat. Frog legs are relatively delicate; once they are overcooked, the flesh becomes tough and rubbery.